The first in Jeff Kinney's side-splitting series, join Greg Heffley as he's thrust into a new year, and a new school, where undersize weaklings share the corridors with kids who are taller, meaner and already shaving. I'll be famous one day, but for now I'm stuck in middle school with a bunch of morons. But when Rowley's star starts to rise, Greg tries to use his best friend's popularity to his own advantage. Recorded in his diary with comic pictures and his very own words, this test of Greg and Rowley's friendship unfolds with hilarious results. Laugh until you cry at all of Greg's hopeless shenanigans. 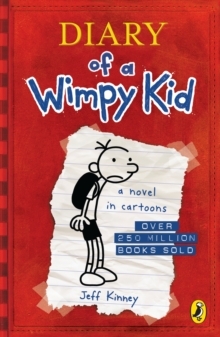 Diary of a Wimpy Kid has got millions of kids reading and laughing at (but mostly with) the famous Greg Heffley. If you're on the lookout for a funny children's book for 7+, especially a book for reluctant readers, you can't go wrong with the Diary of a Wimpy Kid series.